Preheat an oven to 180 degrees celcius an line two baking trays with baking paper (no oil required). Throw dry ingredients into a medium mixing bowl, and stir with enough force and energy to burn off a few cookies in advance. Combine wet ingredients in a bowl, microwave for 30 seconds to improve consistency, stir, then mix into dry ingredients. Add egg replacer, stir again, then roll dough into tablespoonful balls before pressing out onto the tray. They don’t spread much, so you can keep them close together. Bake for 10-12 minutes, leave on the tray to cool for 5 minutes, then move to a wire rack to cool completely. 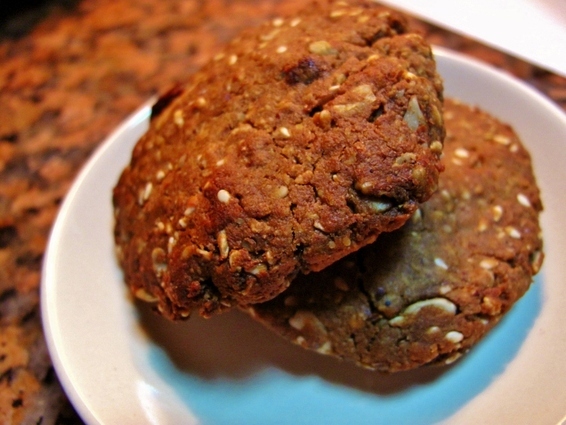 This entry was posted on 06/03/2012 by glutenfreeuae in Baking, Recipes and tagged cookies, gluten free, glutenfree, oats.